Firth, F. E. 1933. 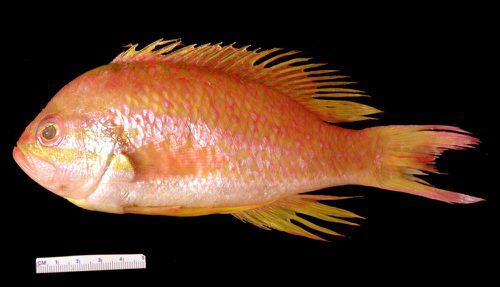 Anthias nicholsi, a new fish taken off Virgina in the deep-water trawl fishery. Copeia 1933(4): 158-160. Collette, B.B., and G. Klein-MacPhee (eds.). 2002. Bigelow and Schroeder's Fishes of the Gulf of Maine, 3rd edition. Smithsonian Institution Press, Washington and London. 748 p.
Klein-MacPhee, Grace / Collette, Bruce B., and Grace Klein-MacPhee, eds., 2002: Sea Basses: Family Serranidae. Bigelow and Schroeder's Fishes of the Gulf of Maine, Third Edition. 391-395.